Several new data reports that are now publicly available on the California Department of Education (CDE) DataQuest Website at http://dq.cde.ca.gov/dataquest/. These reports are based on data submitted and certified in the California Longitudinal Pupil Achievement Data System by districts and charter schools. Please Note: The previous annual data release included prior year one-year graduate and dropout counts, as well as current year long-term English learner (LTEL) and English learners "At-Risk" of becoming LTEL; however, these data are not included in the current release, but will be released at a later date. Lastly, the CDE issued a press release regarding the 2018–19 enrollment data, which is available at https://www.cde.ca.gov/nr/ne/yr19/yr19rel27.asp. SACRAMENTO—State Superintendent of Public Instruction Tony Thurmond announced today the release of 2018–2019 enrollment data for California’s K–12 public schools. The data breaks down enrollment by ethnicity and grade, along with English Language Acquisition Status, and can be sorted by county, district, or school. Enrollment by Race/Ethnicity (Multi-Year): Overall enrollment is down from 6,235,520 in 2014–15 to 6,186,278 in 2018–19 a decrease of 0.8 percent. Also during that time, the percentage of white students decreased from 24.6 percent to 22.9 percent and the percentage of African American students decreased from 6 percent to 5.4 percent. However, between 2014–15 and 2018–19, the percentage of Hispanic/Latino students increased from 53.6 percent to 54.6 percent. English Language Acquisition Status (Multi-Year): Between 2014–15 and 2018–19, the percentage Hispanic/Latino students classified as English Learners decreased from 83.2 percent to 81.3 percent. Overall, between 2015–16 and 2018–19, the percentage of students who are English learners decreased from 22.1 percent to 19.3 percent, while the percentage of students who are Reclassified Fluent English Proficient increased from 16 percent to 18.3 percent during that same time period. Enrollment for Charter and Non-Charter Schools (Multi-Year): While overall enrollment non-charter schools is decreasing between 2014–15 and 2018–19, enrollment in charter schools has increased from 9.2 percent to 10.6 percent of the public school population statewide. Charter and Non-Charter Subgroup Enrollment (2018–19): Charter schools tend to have a smaller percentage of their enrollment who belong to disadvantaged student subgroups, such as English learners, foster youth, homeless youth, migrant students, students with disabilities, and socio-economically disadvantaged. The difference is most pronounced for the English learner subgroup. In 2018–19, 15.1 percent of charter school students are identified as English learners, while 19.8 percent of non-charter school students are similarly identified. The data is compiled by the California Department of Education from data submitted by Local Educational Agencies to the California Longitudinal Pupil Achievement Data System (CALPADS). The updated enrollment data is available on the CDE’s Data Quest website. Many public agencies including public schools and libraries utilize the state master contract CALNET 3 for the purchase of broadband and telecommunications services, some of which may be eligible for E-rate discounts. California's Department of Technology has recently posted extensions to CALNET 3 through June 30, 2020, on the California Department of Technology website. California E-rate applicants citing the CALNET 3 contract on their Funding Year 2019 FCC Form 471 funding requests will want to download copies of the contract amendments reflecting the contract extensions for their E-rate records. The contract amendments are located under the separate "Amendments" sections under Category 1 and Categories 2-7, and under each eligible provider. Check the amendment carefully to ensure the extension cited is through June 30, 2020. USAC has announced that the FCC Form 471 filing window for Funding Year 2019 opened on Wednesday, January 16, 2019, at 12:00 noon EST (9:00 a.m. PST) and will close on Wednesday, March 27, 2019, at 11:59 p.m. EDT (8:59 p.m. PDT). FCC Form 471 applications must be certified within an applicant's E-rate Productivity Center (EPC) portal within these dates in order to be considered to be filed "within window." USAC released FY2018 Wave 47 Funding Commitment Decision Letters (FCDL) on March 1, 2019. As of March 1, FY2018 California commitments total over $273 million. USAC issues FCC Form 486 Urgent Reminder Letters to applicants that appear to have missed the deadline to certify an FCC Form 486. Applicants missing these or earlier deadlines should closely monitor their News Feed in the EPC for an FCC Form 486 Urgent Reminder Letter. This letter will allow the applicant a 15-day extension to submit an FCC Form 486 without penalty. USAC has posted its 2018 E-rate Program Applicant training materials recordings. Recordings of previous webinars are posted on the K12HSN website. As the FCC Form 471 deadline approaches on March 27, applicants should allow for adequate time to complete the necessary information on their applications and to submit and certify by the deadline to be considered "within window." Review and verify contracts for all eligible services expected to continue through the next funding year (July 1, 2019, through June 30, 2020). Review bills for service and ensure funding requests filed include all eligible services and costs expected, including taxes and surcharges. If you find discrepancies and have already certified your FCC Form 471 funding requests, you may either submit corrections via a Receipt Acknowledgement Letter (RAL) correction, or submit a new FCC Form 471 with the correct information prior to the filing deadline. USAC will require you to cancel any duplicate funding requests. Review any bids and/or new contracts for service to ensure they are complete and include the entire costs of all services you expect to order in the 2019 funding year. If they do not include estimated taxes and surcharges, make sure to include these estimates in your funding requests. Some E-rate eligible services, such as Internal Connections, are subject to California sales tax, while recurring broadband services may be subject to California Public Utilities Commission surcharges. If you are in any doubt as to whether or not your services will be subject to these, contact your awarded service provider for clarification. Once you have certified your FCC Form 471 application, it is a good idea to review the application for any errors. You may do this by reviewing the live FCC Form 471 in the EPC or by reviewing the PDF version of the original application. From your Billed Entity's home page in EPC, select the FCC Forms menu to access the Funding Year 2019 certified forms. Each form filed will have a hyperlink taking you to the live form that you may click through to verify information, and which also has a PDF link to the original form which you may download. If you do identify an error, you may submit a request for correction through the Receipt Acknowledgement Letter (RAL) Correction process. Note that only certain FCC Form 470 or FCC Form 471 ministerial and clerical errors may be corrected. If your error does not meet these criteria, it is better to file a new FCC Form 471 with the correct information prior to the filing deadline and to ask USAC to cancel the application that was filed in error. Any errors found after the filing deadline of March 27 must be corrected through the RAL process. Note that RAL corrections may be submitted to USAC up until a Funding Commitment Decision Letter is issued on the FCC Form 471 application. All FCC Form 471 applications undergo Program Integrity Assurance (PIA) review. In some instances, USAC reviewers may reach out to the Contact person listed on the FCC Form 471 to ask questions about the application and/or request documentation to substantiate the eligibility of services, the eligibility of entities receiving services, and the data used to calculate the E-rate discount. Applicants have 15 days to respond to USAC's request for information, and may request an additional seven-day extension. While responses to USAC's questions occur in EPC, the outreach from USAC will be sent to the Contact's e-mail address. Failure to respond to USAC's questions will lead to the denial of the FCC Form 471 funding requests. This is a reminder that the California English Language Development Test (CELDT) contract will officially end on December 31, 2018. The CELDT website and secure District Portal (www.celdt.org) will close as of that date and all data and CELDT Program information will no longer be available. 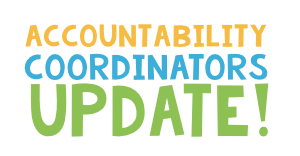 LEA Coordinators should access the CELDT website and District Portal before December 31 to obtain information and data files and/or order electronic data files and/or copies of paper reports prior to December 31. Refer to the Download and Order CELDT Reports Before the End of the Year email posted on the Communications Log for more information. For inquiries about this process, please contact the CELDT Customer Support Center by phone at 866-850-1039 or by email at . Local educational agencies (LEAs) are reminded that the close of the End-of-Year (EOY) submission amendment window is Friday, August 24, 2018 at 5:00 p.m. It is critical for LEAs to certify accurate data by this deadline, as there will be no other opportunities to amend these data. LEAs that fail to certify EOY 1 will not have college-credit bearing course information (dual enrollment) and Career Technical Education (CTE) completer data factored into the calculation of the College/Career Indicator, which will be included in the 2018 California School Dashboard, nor will LEAs that receive Perkins funding meet federal reporting requirements. Those LEAs that fail to certify EOY 2 will not have Title I program participation and services data and homeless student counts to report to the federal government as required by law. And finally, LEAs that fail to certify EOY 3 will not have a discipline indicator or chronic absenteeism indicator on the 2018 California School dashboard, which will negatively impact their performance level. Additionally, LEAs without EOY certified data will have no data posted on DataQuest. 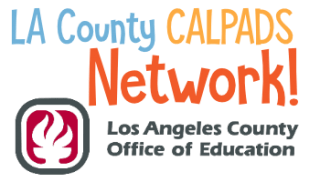 As noted in the April 2018 CALPADS Information Meeting (CIM), there are plans to move CALPADS into the cloud, update the user interface, and redesign the security model as we work to transition the California Special Education Management Information System (CASEMIS) into CALPADS in the 2019–20 school year. The system upgrade will take place the last week in September 2018. 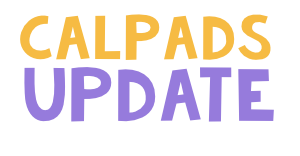 Currently, CALPADS is scheduled to go offline on September 21 and remain down until October 1, 2018. LEAs are encouraged to obtain all necessary Statewide Student Identifiers (SSIDs) prior to the down time, so that assessment testing will not be impacted. The CDE will send out additional communication regarding the security model changes and training opportunities at the end of August, and we will notify LEAs of any changes to this schedule. non-English primary language and may be in need of English learner services. In these cases, students should be tested with the Initial English Language Proficient Assessments for California (ELPAC) to determine if the student's ELAS should be corrected to English Learner (EL) or Initial Fluent English Proficient (IFEP). As described in CALPADS Update Flash #138, once the Initial ELPAC has been administered, the LEA must load the raw scores and the test completion date into the Test Operation Management System (TOMS) Local Scoring Tool (LST). Scores may only be loaded into the LST if the student has an ELAS of To Be Determined (TBD) in CALPADS. However, CALPADS will not allow an ELAS progression from EO to TBD until modifications are made to CALPADS on August 28, 2018. Notify the parents or guardians of the intent to administer the Initial ELPAC within 10 days of administration. Administer the Initial ELPAC to the student, hand score the test, and provide the parents or guardians preliminary results within 14 days after test administration. Retain the scores for entry into the LST at a later date. On or after August 29th, ensure that the student has an enrollment record in CALPADS with a start date of the first day of school. On or after August 29th, submit a Student English Language Acquisition (SELA) record with an ELAS of TBD, ELAS Start Date of 7/1/2018 or greater and at least one day prior to the test completion date, and a non-English Primary Language to CALPADS. Once the student appears on the Initial ELPAC Student Eligibility Report, enter the scores into the LST and download the Student Score Extract. Upload the official ELAS to your student information system (SIS) and submit a new SELA to CALPADS that reflects the student's status of EL or IFEP with an ELAS Start Date of the date testing was completed. 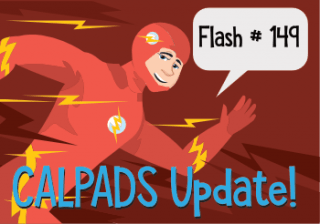 NOTE: The system modifications needed to enter the corrected ELAS will not be implemented in CALPADS until October. Education Code (EC) sections 48300–48317 establish the District of Choice Program, and require school districts to register as a District of Choice. Only districts who have registered as Districts of Choice should use Student School Transfer Category Code 4 – District of Choice for students transferring in from other districts. Recent analysis of the data show that there are some districts that have not registered as Districts of Choice that are inappropriately using this transfer category code. It should be noted that the CDE is required to investigate complaints of school districts operating as a school district of choice without registering (EC Section 48317). Currently only 45 districts registered to be a District of Choice by the July 1, 2018 deadline, which was the statutory deadline for the 2018–19 school year. In subsequent years, the registration deadline shall be October 15 for the following school year. The list of school districts registered as Districts of Choice for 2018–19 will be posted on the CDE website. 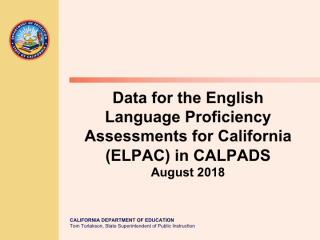 This is the PowerPoint presentation for the "Data for the English Language Proficiency Assessments for California (ELPAC) in CALPADS" webinar from last week.